For the other airport serving Nagoya, see Nagoya Airfield. 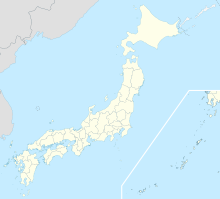 Chubu Centrair International Airport (中部国際空港, Chūbu Kokusai Kūkō) (IATA: NGO, ICAO: RJGG) is an international airport on an artificial island in Ise Bay, Tokoname City in Aichi Prefecture, 35 km (22 mi) south of Nagoya in central Japan. Centrair is classified as a first class airport and is the main international gateway for the Chubu ("central") region of Japan. The name "Centrair" (セントレア, Sentorea) is an abbreviation of Central Japan International Airport, an alternate translation used in the English name of the airport's operating company, Central Japan International Airport Co., Ltd. (中部国際空港株式会社, Chūbu Kokusai Kūkō Kabushiki-gaisha). 10.2 million people used the airport in 2015, ranking 8th busiest in the nation, and 208,000 tons of cargo was moved in 2015. Chubu Centrair is one of Japan's five off-shore airports, developed after Nagasaki Airport and Kansai International Airport and before Kobe Airport and Kitakyushu Airport. Chubu Centrair is the second airport built in Japan on a manmade island, after Kansai International Airport. Chubu Centrair serves the third largest metropolitan area in Japan, centered around the city of Nagoya. The region is a major manufacturing centre, with the headquarters and production facilities of Toyota Motor Corporation and production facilities for Mitsubishi Motors and Mitsubishi Aircraft Corporation. With much lobbying by local business groups such as Toyota, especially for 24-hour cargo flights, construction started August 2000, with a budget of JPY¥768 billion (€5.5 billion, US$7.3 billion), but through efficient management nearly ¥100 billion was saved. Penta-Ocean Construction was a major contractor. In addition to cost-cutting measures, a number of environmental protection measures had been taken after learning from Kansai International Airport. The artificial island itself was shaped like the rounded letter "D" so that sea currents inside the bay will flow freely. Its shores were partially constructed with natural rocks and sloped to aid sea lifeforms to set up colonies. During the construction a species of little tern occasionally came, so a part of the island was selected and set aside to aid nesting. According to Japanese media sources, Kodo-kai, a Yakuza faction in the Yamaguchi-gumi group, earned an immense amount of money by being the sole supplier, via a front company called Samix, of dirt, rock, sand, and gravel for the airport construction project. Although several Samix executives were criminally indicted for racketeering, the prosecutions were later dropped. According to the sources, Kodo-kai had informants working within the Nagoya police who fed the organization inside information which allowed them to stay a step ahead of investigating authorities. When Chubu Centrair opened on 17 February 2005, it took over almost all of the existing Nagoya Airport's (now Nagoya Airfield) commercial flights, and relieved Tokyo and Kansai areas of cargo shipments. As a replacement for Nagoya Airport, it also inherited its IATA airport code NGO. The airport opened in time to service the influx of visitors for Expo 2005, located near Nagoya. The airport is speculated to have some competition with Shizuoka Airport, which opened on 4 June 2009. Japan Airlines (JAL) was the first airline to land an aircraft at Chubu Centrair: a Boeing 767-300ER, carrying around 206 passengers on board a charter flight from Saipan to commemorate the opening of Chubu Centrair. There were several withdrawals from Chubu Centrair after the airport commenced its operation. American Airlines operated a route to Chicago for less than seven months in 2005, but said the service was "not as profitable as we had hoped". In 2008, after a few years of service from Chubu Centrair, several airlines cancelled certain flights and put others on hiatus, including Malaysia Airlines' suspension of flight to Kuala Lumpur, Jetstar ending its airport operation, Continental Airlines stopping its Honolulu flight and United Airlines' suspension of flights to San Francisco, citing low premium cabin demand. This flight also continued to Chicago until 2007. Emirates and Hong Kong Express Airways left the airport in 2009, although HK Express resumed service from September 2014. Garuda Indonesia ended service from Denpasar in March 2012, but resumed service to Nagoya with the opening of direct flights from Jakarta in March 2019. EVA Air left the airport in June 2012 (they have since planned to resume service from June 2019). TransAsia Airways subsidiary V Air withdrew from Centrair and ended operations in October 2016. Nagoya continues to offer intercontinental flights through Delta Air Lines' services to Detroit and Honolulu, Lufthansa's service to Frankfurt and Finnair's service to Helsinki. Three construction projects are ongoing to the southeast of the main terminal: "Flight of Dreams" to be completed in summer 2018, a low-cost carrier terminal to be completed in early 2019, and the Aichi International Convention Center to be completed in fall 2019. The main terminal is shaped like a "T", with three piers radiating from a central ticketing area. This design keeps check-in distances below 300 m (980 ft). Originally, designers planned to make the main terminal resemble an origami crane from above, but this plan was abandoned due to cost. The northern side of the terminal holds domestic flights, while the southern side holds international flights, each with dedicated ticket counters, security checkpoints and baggage carousels, and for international flights, immigration and customs facilities. Arrivals are processed on the second floor, and departures on the third. The lower level is used for maintenance, catering, and other ground operations, as well as for passenger buses to hardstands in the middle of the airport ramp. There are thirteen gates for domestic flights (including three bus gates), and fourteen for international flights (including three bus gates). Central Japan International Airport Station, the train station for Centrair is located on the Meitetsu Airport Line operated by Nagoya Railroad (Meitetsu). The fastest "μSky Limited Express" service connects the airport to Meitetsu Nagoya Station in 28 minutes. Meitetsu Nagoya is adjacent to JR Nagoya Station, allowing transfers to Shinkansen high-speed trains bound for Kyoto and Shizuoka, as well as JR, Meitetsu, and Kintetsu local trains, and the Nagoya Municipal Subway. There is a proposal for a JR line linking Centrair to Nagoya Station and the JR system through Taketoyo Line's Okkawa Station. Centrair Limousine provides direct bus service to and from central Nagoya, Sakae, and major hotels. And operated by private bus company in Mie Prefecture, High-speed bus to the neighboring prefectures, the bus of 3,000yen to Kyoto via Mie Prefecture has been operating. Three high-speed ferry services link Centrair to the west side of Ise Bay. One ferry connects to the passenger terminal in Tsu – a 40-minute trip. Another ferry links Matsusaka to Tokoname, taking 45 minutes. A toll road links Centrair and the mainland. Centrair features the 4th Floor Sky Town Shopping Center, accessible to the general public, with 61 shops and restaurants. organized into two "streets", Renga-dori and Chochin-yokocho. The Chochin-yokocho shops are individually themed to have an authentic Japanese look. The Boeing Dreamlifter Operations Center is located on the airport's apron, to the south of the main terminal. This facility is used to store Japanese components of the Boeing 787 aircraft while awaiting airlift to the assembly facility in the US. 2011: 5th Best Airport Worldwide of the Airport Service Quality Awards by Airports Council International and Best Airport by Size in the 5 to 15 million passenger category. 2015: Skytrax announced Chubu International Airport won the first place in the "Best Regional Airport 2015" award and first place in the "Best Regional Airport - Asia" award for the fifth year running. 2016: Skytrax rated Chubu International Airport as the "World's Best Regional Airport 2016" and the 6th "Best Airport Worldwide"
2017: Chubu International Airport became the first airport in the world to achieve "5-Star Regional Airport Rating" by Skytrax. 2018: For 4 consecutive years, Chubu International Airport won "The World's Best Regional Airport" award (Skytrax). Chubu was also ranked the 7th best airport in the world. ^ "Chubu International Airport" (PDF). Japanese Ministry of Land, Infrastructure, Transport and Tourism. Archived from the original (PDF) on 21 October 2016. Retrieved 7 January 2017. ^ "Feb 10, 2005 GOODBYE & AND THANK YOU KOMAKI AIRPORT". Retrieved 7 June 2015. ^ "Central Japan International Airport". Retrieved 23 March 2014. ^ Skertic, Mark (1 October 2005). "American Airlines to end flights to Nagoya, Japan". Chicago Tribune. Retrieved 13 December 2013. ^ "LCC eyes Nagoya-Kuala Lumpur runs". Kyodo. 13 September 2013. Retrieved 13 December 2013. ^ Brown, Steven (22 July 2008). "United Airlines to stop flying to Nagoya from S.F." San Francisco Business Times. Retrieved 13 December 2013. ^ a b "中部国際空港セントレアのご案内" (PDF). Chubu Centrair International Airport. 1 June 2017. Retrieved 17 October 2017. ^ "Airport Guide" (PDF). Chubu Centrair International Airport. Retrieved 13 December 2013. ^ a b "China Eastern Adds Yantai - Nagoya Service in Sep/Oct 2015". Airlineroute.net. 8 September 2015. Retrieved 8 September 2015. ^ "China Southern boosts Harbin international routes in S19". routesonline. Retrieved 12 March 2019. ^ "Garuda Indonesia resumes Nagoya service in March 2019". routesonline. Retrieved 21 November 2018. ^ "Jetstar Route Map". Jetstar. Retrieved 9 February 2015. ^ "Juneyao Airlines revises Nanjing – Nagoya service to June 2019". routesonline. Retrieved 15 April 2019. ^ a b "Shandong Airlines plans Nagoya service launch in S19". routesonline. Retrieved 11 March 2019. ^ "Shanghai Airlines adds Guangzhou – Nagoya service from April 2019". routesonline. Retrieved 11 March 2019. ^ "T'Way Air adds Jeju – Nagoya service from April 2019". routesonline. Retrieved 5 February 2019. ^ "Thai Lion Air schedules additional routes to Japan in 1Q19". routesonline. Retrieved 27 December 2018. ^ "Tianjin Airlines adds Tianjin – Nagoya service in S19". routesonline. Retrieved 5 February 2019. ^ 2018, UBM (UK) Ltd. "tigerair Taiwan adds new Japan routes from July 2018". Routesonline. Retrieved 1 June 2018. ^ "Centrair Limousine - Chubu Centrair International Airport, Nagoya". Retrieved 7 June 2015. ^ "AIRPORT BUS". Retrieved 10 February 2018. ^ "Nonstop Express Limousine Bus Service". Retrieved 1 April 2018. ^ "The World's Best Airports 2009 – Asia Comes out on Top" Businessweek. Retrieved 23 March 2014. ^ "World's best airports announced – Asia dominates" CNN Go. 15 February 2012. Retrieved 12 April 2012. ^ "ASQ Award for Best Airport by Size (5-15m)". Airports Council International. 14 February 2012. Retrieved 13 April 2012. ^ "Chubu International Airport awarded Best Regional Airport 2015". Retrieved 19 January 2018. Wikimedia Commons has media related to Chubu International Airport. Wikivoyage has a travel guide for Chubu Centrair International Airport.